Jagex's digital card game Chronicle: RuneScape Legends will launch in 2015. It barely needs saying, at this point, that Hearthstone has been a huge success for Blizzard. Enthralling players since the early days of its open beta, the game has amassed a player base of more than 20 million since its official launch earlier this year in March. Just in case it needs clarifying, that, in the business world, equals money. It was only a matter of time, in turn, before somebody else in the MMO world tried to replicate the game's rampant success. 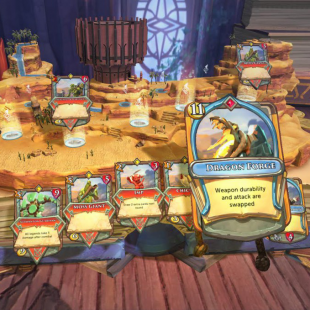 In an announcement at this year's RuneFest this past weekend, the studio revealed that it will be launching a new "collectible card game" dubbed Chronicle: RuneScape Legends. Currently slated to launch in 2014 on PC, Mac, tablets and mobile platforms, the game will taken place "within the pages of a living book" and focus on "quest building" that will allow players to create "their own miniature RPGs" where they'll be able to battle RuneScape boss monsters "before entering into tense PVP combat." According to the developers, RuneScape Legends has been in development "since the start of the year" and its their hope that the game will help to "broaden the brand's appeal" to wider audiences going forward. "Chronicle: RuneScape Legends represents an important step for Jagex as we add a new game into the RuneScape family," said Jagex vice president Phil Mansell. "This announcement tops a strong 2014 where our flagship title has continued to thrive." The obvious question, of course, is whether or not RuneScape Legends will be able to able to claim any sort of foothold with Hearthstone and other digital collectible card games already holding so much ground. On the one hand, it's tempting to just roll your eyes and say "heck no." That said, Jagex has expressed confidence that the game's quest building features will help it stand out from the crowd. Likewise, it's worth remembering that RuneScape itself has managed to stay alive and expand for more than a decade, despite being very much in the shadow of World of Warcraft. We've reached out to studio hoping to learn more about its strategy for the RuneScape Legends and will update you when we hear back.